Demand for heating equipment is expected to grow 4.5% per year to $5.1 billion in 2021. The residential market will continue to outperform the commercial market. Warm air furnaces will remain the dominant type, though steel boilers will post the fastest value increase of any product type in percentage terms. The Midwest, accounting for nearly one-third of all heating equipment demand in a given year, though the West is forecast to see the sales gains in percentage terms. 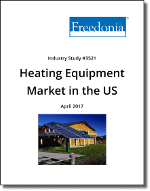 This Freedonia industry study analyzes the US heating equipment market with historical demand data plus forecasts for2021 by product (boilers, room and zone heating equipment, warm air furnaces), energy source (natural gas, electricity, and heating oil and other), market (residential and commercial, new building and existing building), and US region (Midwest, South, Northeast, West). The study also evaluates company market share and analyzes key producers including AO Smith, Burnham Holdings, Daikin Industries, Ingersoll-Rand, Lennox, Melrose Industries, Mestek, Paloma, SPX, and United Technologies.